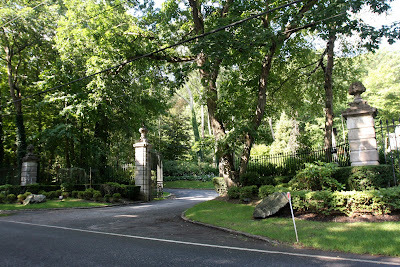 The front gate to 'La Lanterne', the James B. Clews estate designed by Horace Trumbauer c. 1929 in Brookville. Click HERE for more on 'La Lanterne'. Coming home after a hard day on Wall Street, Mr. Clews must have been well assured of his own importance and success. as the Chauffeur drove him through those gates. I've always liked it that you show lots of the gates to these places...they're an important part of the whole, and often amazing pieces of architecture and craft. There aren't many left that are as impressive as these but I'll make a point to photograph even the smaller ones to put up on here. Sometimes the gates are all that's left.